I predict that the shorter I cut the putty, the lower the resistance will be. The longer the length of putty, the higher the resistance will be. I think that this is because there are more atoms in a larger cylinder of putty than there are in a smaller piece of putty, this therefore means that in the larger cylinder of putty there is more chance that the electrons will collide with one of the atoms, therefore there is more resistance. Conductors have lower resistance when they are shorter because the electrons have a shorter distance to travel so more energy is conserved since there are fewer collisions, and the current is higher. Once the equipment is set up correctly, make a record of a reading of the resistance, and then repeat this reading twice, this is to make sure that none of your readings have been taken incorrectly, and that it is the correct sized cylinder, you could also measure the weight of the putty. Make sure that there aren’t any gaps in the insulating plastic, before connecting to a power supply. Don’t run a too high voltage through the circuit, until you are sure that it is safe to do so. Do not override the power supply. I think that my results have given me enough evidence to show that my prediction is correct. My results are very good and have no mistakes within them. I think that this was a suitable procedure to use to investigate resistance, as it showed what I needed to know very clearly, but if I could re-do this experiment another time, I would take more sets of results, in order to be more accurate with my results. 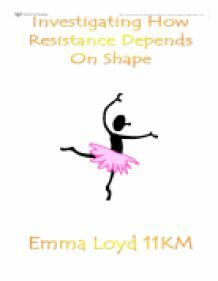 I think that therefore, I can rely on my results answer my earlier question of ‘how does resistance depend on shape’ thoroughly and correctly. In some circumstances it is possible for an electron in the lower band to gain enough energy to jump into the higher band and become a charge carrier. As the temperature of the conductor rises, the amplitude of vibration of the atoms increases and drifting electrons then make more collisions with atoms. Practical Assessment for Physics: Investigating the Resistance of Conducting Putty. 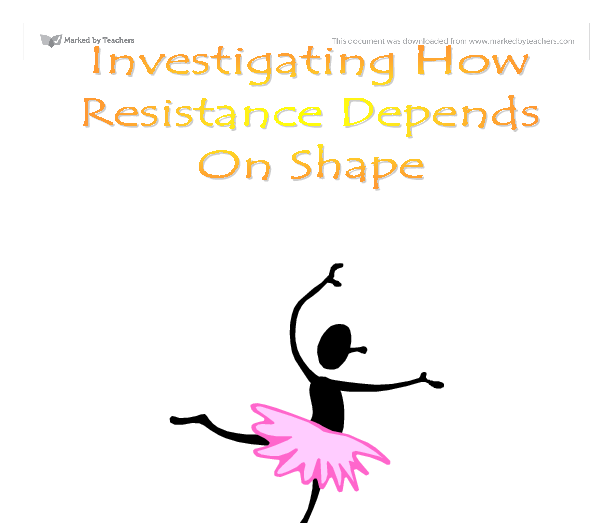 According to the above given formula, the resistance can be noticed by the gradient. The gradient of the graph of Aluminium is more and so the resistance will be less. This will quite the opposite for nichrome. So therefore the Aluminium has less resistance we notice from the graph. were not very reliable because the current increases and voltage decreases were fairly large that an accurate graph of current against voltage could not be plotted. Only four current and voltage reading were taken at each voltage setting on the power supply which meant that a small range of results could be plotted on a graph. difference from the inputted value at around 1434? - 1435?. I can derive from this, that in theory at least, it would be better to use the first circuit for smaller resistances up to about 1435? and after this, Circuit Two would be more accurate. which are free to move from one carbon atom to another . When a current is passed through the putty electrons from the carbon atoms move along the putty and 'bump' into the other carbon atoms which will slow them down.